There are a number of curious details in what Littleton is saying here. He is self-consciously aware of the significance of his recollections to the degree he believes Tommy is being provided with an alibi. He also cites when Tommy arrived in Mr. Skakel's room in terms of the Greenwich Police Department's report, as opposed to his own memory. He implies, as well, that he now knows Tommy's report was a front. Evidently, Littleton is looking back at the night of October 30, 1975 through a filtered and guarded perspective. He is highly aware of certain investigative details. Littleton has occasionally left interviewers with the impression he was trying to learn what was officially known about the case. With the Sutton Associates investigator who interviewed him in Boston, Littleton evinced this tactic to a moderate degree. On the night of October 30, 1975, Ken recalls going outside because Nanny Sweeney asked him to check on the barking dogs. His recollection is hesitant, but he believes it was about 9:30 pm - soon after The French Connection had started. Going out the front door, he walked right along the circular driveway and stood by the cypress trees. He claims to have heard some "rustling." Interestingly, Littleton told our investigators that the rustling was coming from a spot in the darkness located about twenty-five yards into the back lawn. This could, conceivably, be where we now know, according to Tommy, that Tommy and Martha were having their sexual encounter. OCTOBER 30, 1975 The following segments provide a general context for information regarding Tommy's activities on the night of Martha Moxley's murder. 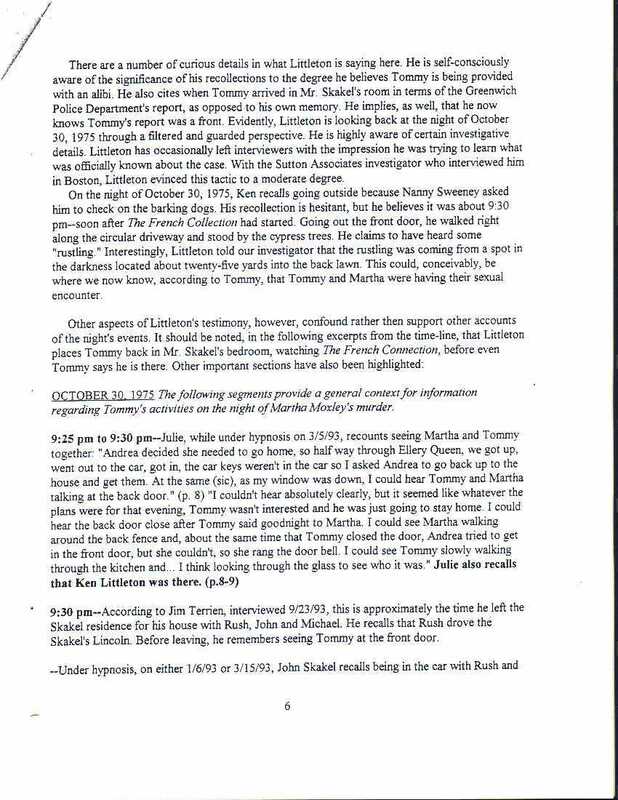 9:30 pm--According to Jim Terrien, interviewed 9/23/93, this is approximately the time he left the Skakel residence for his house with Rush, John, and Michael. He recalls that Rush drove the Skakel's Lincoln. Before leaving, he remembers seeing Tommy at the front door.